The “afterlife of totalitarianism” is an idea, or maybe a potential meme, with a haunting quality. It’s a notion I first ran into in the subtitle of Yale University historian Marci Shore’s 2013 book about post-communism, The Taste of Ashes: The Afterlife of Totalitarianism in Eastern Europe. It’s also a useful catchphrase that informs and underlies much of the rise of right-wing politics in Europe today. It doesn’t cover everything, of course. Even in European countries that directly experienced fascism or communism (or, in several places, such as Hungary, that had both in succession), the degree of “totalisation” was different, and differed at various historical periods. Staying alive during the time of the lethal Stalinist show trials in Hungary, c. 1950, was quite different from life during the Janos Kadar regime’s period of “goulash communism” in the 1980s, just to take one of dozens of examples. The current burgeoning of far right movements and parties in Europe can be found in both the former Soviet bloc eastern European countries and what we like to think of as the more traditional democracies of western Europe. Nor is Europe alone. Similarly worrisome conflicts over governance and democracy are unfolding around the world, whether we’re talking about China, Russia, the Middle East, much of Africa, or the Americas, not excluding the United States (and its Donald Trump phenomenon). Since terms like fascism and totalitarianism tend to get tossed around rather carelessly, it helps to keep in mind Hannah Arendt’s distinction, which she makes in The Origins of Totalitarianism (1951; 1958), between all-encompassing, ideologically-driven totalitarianism that seeks to control the totality of human life (the sort portrayed in George Orwell’s novel, Nineteen Eight-Four), and simply authoritarian regimes that seek a monopoly of political power. If that distinction isn’t made, there’s a danger that the notion of totalitarianism itself, as well as its “afterlife,” will be reduced to little more than a facile meme. It’s also worth noting that in some of “the dark places of the earth” (to recall Joseph Conrad’s memorable phrase in Heart of Darkness), dictatorship has either given way to “failed states” (Libya, Somalia, Yemen… ?) or has had no “afterlife” only because absolutist rule never ceased (North Korea, Belarus). In post-Cold War Europe itself, where it was expected that the afterlife of fascism and communism would lead directly to straightforward liberal democracy, the actual historical outcome has been far more complex and disturbing. And, again, we’re not just talking about the former Soviet and Yugoslavian countries in Europe. 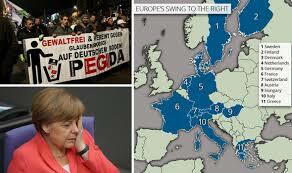 Much the same is occurring throughout the 28 member states of a currently severely disaffected European Union. More than a quarter-century after the fall of the Berlin Wall in 1989, the spectre that is haunting Europe today is the appearance of new forms of incipient totalitarianism and authoritarianism. Suddenly, the rise of the right has become, as they say on Facebook, a “trending” topic in summer 2016. At the same time, it’s important to avoid alarmist generalizations, as though right-wing politics represents a kind of destiny. It’s true, however, that a slew of right-wing parties and conservative movements has achieved unexpected prominence throughout Europe in this decade. It’s not only the afterlife of totalitarianism, but the future of authoritarian movements and possibly even governments that Europe is currently fretting over. These groups and parties are characterized by a deep conservatism that features virulently hostile attitudes toward refugees, immigrants, Islam, and the European Union itself, as well as a corresponding resurgence of old-fashioned breast-thumping nationalism. The May 2016 presidential election in Austria provides a cogent example. 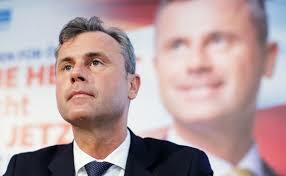 The far right-wing Freedom Party (FPO) candidate, Norbert Hofer, came within a whisker of becoming the first European extreme-right head of state since World War II. After Austria’s long-time mainstream governing parties, the Social Democrats (SPO) and the right-of-centre Austrian People’s Party (OVP), were eliminated in the first of the two-round 2016 presidential contest — the decline of major traditional parties is itself a feature of the current discontent — Hofer became the front-runner, and voters opposed to the extreme right had to coalesce, willingly or not, around the independent candidate who placed second in the initial round. 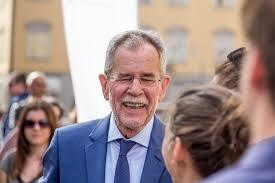 Austrian president Alexander van der Bellen. 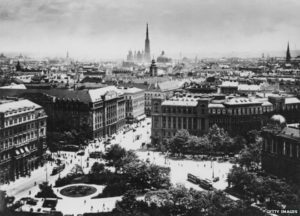 Many Austrians seem to be suffering from (or perhaps enjoying) a kind of historical amnesia, having forgotten both the past of the Austrian right as well as the fate of the country prior to and during World War II. The FPO’s most notorious leader was the late Jorg Haider (1950-2008), a more or less open Nazi acolyte, who led the party not only to more than a quarter of the vote, but into Austrian government in 2000 (in a coalition with the right-of-centre OVP). Haider’s far-right FPO quickly foundered once in office, and internal disagreements led to a splintering by 2005. The mysterious and conspiracy-minded Haider died in a car crash in 2008 (which inspired its own conspiracy theories). Now led by Heinz-Christian Strache, the FPO chose the more publicly acceptable Norbert Hofer as its presidential candidate. Hofer is someone who, according to a current bitter quip, is “the friendly face of fascism”; however friendly, he campaigned armed with a Glock pistol to protect himself, he said, in the “uncertain times” of the refugee crisis. Friendly or not, the FPO is a major player in the music-box discordance of Austrian politics. The inescapable message of the recent Austrian election is that half of the voting inhabitants of the country (population, 8.6 million) cast their ballots in 2016 for a party historically rooted in neo-Nazism. Austria, for those unfamiliar with its past, is a country that likes to bill itself as “the first victim of Nazism,” recalling Nazi Germany’s takeover of the country in March 1938, while conveniently forgetting that much of the Austrian population offered substantial and enthusiastic support for Hitler’s annexation, or Anschluss. Next door to Austria, Chancellor Angela Merkel’s Germany last year adopted a bold refugee-welcoming policy. A million fleeing victims from the Syrian civil war were admitted to the country in 2015. Germany did something similar during the Yugoslavian wars of the early 1990s, taking in more refugees than any other European country. Once again, in the case of Syria, while Germany fulfilled international and historical obligations to refugees, most of the rest of the European Union (EU) balked at taking in the endangered foreigners from the Middle East. What’s more, in Germany itself, there’s been a growing backlash. An anti-Islamic movement that goes by the unwieldy moniker of Patriotic Europeans Against the Islamisation of the West (Pegida), based in the former East German city of Dresden, has been demonstrating against refugees for the last two years. When an ideologically similar political party, the Alternative for Germany (AfD) ran in provincial elections in March 2016, it scored a troubling enough 12-15 per cent share of the vote in two prosperous western German provinces but, worse, this right-wing party rolled up a genuinely alarming 24 per cent of the tally in the former East German province of Saxony-Anhalt, where it finished second to the incumbent right-of-center Christian Democratic Union (CDU), the party that Merkel heads federally. The regional election result, which represented a rebuke to the liberal refugee policy, was enough of a shock to Germany’s political balance to be a factor in Merkel’s (and the EU’s) subsequent deal with Turkey. The latter has its own authoritarian leader, Recep Erdogan, who heads a regime that recently stripped elected members of the Turkish government of the traditional democratic right of parliamentary immunity. The EU-Turkey pact has in effect temporarily staunched much of the Middle Eastern refugee flow, and thoroughly undercut Merkel’s once-daring humanitarian policies. But she had little choice other than to backtrack, given the German anti-refugee election results, and the recalcitrance of other EU member states to recognize and act on the refugee crisis. Similar rise-of-the-right stories can be found in Hungary, Poland, Slovakia, Croatia and other countries that had little experience of democracy in their histories before or after World War II, and where totalitarianism took fascist and/or communist forms. Certainly, democratic “deficits” and uncertainties might be expected in countries like Albania, Romania, Bulgaria and Serbia, given their histories. But Poland’s recent descent into nationalism and clericalism represents one of the more striking disappointments in the enlarged EU (Poland became an EU member in 2004). In Poland, the trade union-based Solidarity movement toppled the four-decade rule of the Communist Party in the country’s first free elections in June 1989. At first, post-communist Polish democracy leaned toward moderate left-of-centre governments populated by the dissidents who made the Polish transition. Well-known opponents of the regime such as Jacek Kuron and Jan Litynski became ministers of government, and others, such as Adam Michnik, became editors of the country’s most important newspapers. However, from the beginning, Solidarity was a broad coalition that ideologically included everyone from anarcho-syndicalists to fervent nationalists and groups loyal to the Polish pope, John-Paul II. That coalition of convenience gradually morphed into a pro-nationalist, pro-clerical right-wing regime in the succeeding quarter-century. 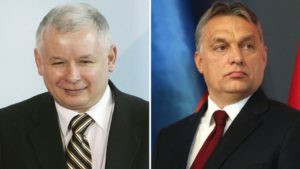 (l.) Poland’s Jaroslaw Kaczynski; (r.) Hungarian PM Victor Orban. For the past decade, Poland has been mostly governed by the nationalist Law and Justice Party (PiS), led by a pair of twin brothers, the Kaczynskis, Lech and Jaroslav. The former was president of Poland from 2005 to his death in a plane crash in 2010. The latter served as prime minister of Poland during part of his brother’s presidency, unsuccessfully ran for president after his brother’s death, but in fall 2015, as party head, led PiS to a thumping parliamentary victory. The subsequent majority government moved quickly to increase its grip on state institutions. Its policies have undercut judicial independence, hobbling the nation’s Constitutional Tribunal, placed state-owned media under more direct government control, and increased police surveillance powers, while hewing to the views of the Catholic Church (for example, on such issues as abortion). The centre and what remains of a left in Poland have been reduced to public demonstrations against the incipient authoritarian regime. On the first weekend of June 2016, the 27th anniversary of Poland’s first post-communist elections, more than 50,000 people took to the streets of Warsaw to protest government policies, not for the first time. While the number of demonstrators is not inconsequential, the protest nonetheless has the feel of a rearguard action. If Poland was a hopeful example of popular democratic possibilities a quarter-century ago, today it’s a much diminished, politically cramped state, its ideological atmosphere poisoned with more than a whiff of xenophobia and anti-semitism (notwithstanding the general absence of Jews and refugees in its population). Once again, it should be underscored that it’s not just in the former Soviet bloc and neighbouring Eastern European and Balkan lands where the right is surging. In France, the Netherlands, Denmark and elsewhere in “old Europe” there are burgeoning rightest parties, and certainly Britain’s “Brexit” referendum vote in June 2016 on whether to exit the European Union or not was a backlash debate fomented by the right-wing, Nigel Farage-led United Kingdom Independence Party (Ukip) and rightest segments of the governing Tory party. There’s one common thread running through conversations I’ve had with friends over the last few months. It’s that there is a befuddled recognition that the present “conjunction” (as we used to refer to such situations) is one of the most puzzling moments in recent political history. Accompanying that recognition is stubborn disbelief that something like a right-wing political redux could be happening here and now. While Islamist terrorism may strain credulity in terms of beliefs and brutality, there’s a sense in which it’s comprehensible. For baffled liberals and those to their left, the return of the repressed right in Europe seems unreal. One notable feature of the discussion in spring 2016 is how many observers, pundits, journalists and scholars have joined an alarmed chorus sounding a mutual warning on present dangers. 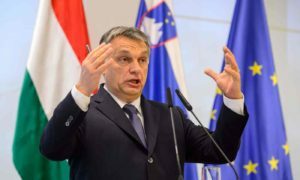 In a thumbnail country-by-country survey of the burgeoning right, Tisdall notes that the “Polish defiance of European norms is hardly groundbreaking.” A more notorious precedent, he points out, can be found in Hungary, where Viktor Orban’s majority right-wing Fidesz government has been joined by the even more extreme Jobbik movement to command more than three-quarters of the Hungarian parliament, producing a melange of policies, from anti-immigration barbed-wire fences, to cozying up to Vladimir Putin’s right-wing, nationalist Russia, to undermining the EU’s bedrock rule of law. 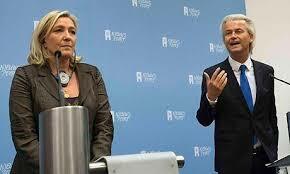 France’s Marine Le Pen (l.); Netherlands rightest Geert Wilders. In countries like France, which has been spared extreme regimes ever since the end of World War II when the Nazi-installed Vichy government fell, the far-right National Front of Marine Le Pen is poised for next year’s presidential and legislative elelections, where, as Tisdall notes, it likely “will have a big say.” Novelist Michel Houellebecq’s recent political satire, Submission (2015), in which the writer imagines a near-future French election that sees Ms. Le Pen barely edged out by a moderate Muslim candidate (backed by the country’s mainstream parties) doesn’t seem so far-fetched these days. Tisdall argues that “the motivating issues shared by these far-right and nationalist grouping includes fears over the migrant influx from Syria and elsewhere, economic insecurity and lack of jobs, increased public disillusionment with the established centre-left and centre-right parties, distrust of an elitist undemocratic EU, and a supposed crisis of identity — meaning the perceived loss of national, ethnic and cultural cohesion.” Among the many “enervating” factors that Tisdall identifies, a key one is “widespread political apathy and alienation, especially among young voters who, oddly enough, have most to lose from long-term political dysfunction.” He cites record low turnouts in recent European parliamentary elections. Some analysts, like Croatia’s young leftist philosopher, Srecko Horvat, take a broader historical perspective, advising us to heed the lessons of 1913. Horvat recalls that in that pregnant year, living in the city of Vienna at the same time were “a worker from Croatia, one unsuccessful painter, two Russians, a guy who analyses dreams, and a young Austrian soldier” — namely, Tito, Hitler, Stalin, Trotsky, Freud and Archduke-designate Franz Ferdinand. The latter was heir presumptive to the throne of the Austro-Hungarian empire until his assassination, which became the proximate cause of World War I. Certainly, it was an unusual set of neighbours in the empire’s capital, Vienna. Horvat could even have added philosopher Ludwig Wittgenstein to that roster, who on the death of his wealthy father in 1913 popped into Vienna to give his inheritance away to his siblings. Indeed, the complaints about “elites” by “ordinary” people, or their surrogates, featured prominently in the recent Brexit debate in Britain. In France, figures like Marine Le Pen offer themselves as champions of “the invisible and the forgotten,” Bittner notes. He recalls that in the 1930s, “The elites were blamed for the resulting chaos, and the masses were ripe for a strongman to return order to society.” Bittner suggests that today, as in the 1930s, “we are seeing the failure of the liberal mainstream to respond to serious challenges, even those that threaten its very existence.” It’s a grim prognostication. — George Orwell, “England, Your England” (1941). If additional evidence of a rising populist right is needed, the Brexit referendum reveals a usually sober United Kingdom following its right-wing Pied Pipers into political and economic uncertainties. We had been warned for weeks – both citizens of the United Kingdom and observers on the Continent like myself, watching from Berlin – that the British referendum on whether to remain a member state of the European Union or to leave the EU, the referendum known as “Brexit” (for “British exit”), was too close for the pollsters and gambling agency bookmakers to call. Yet when we woke up the morning after the vote on June 23, 2016, we were still utterly surprised to discover that Britain, after more than 40 years’ membership in the EU, had voted 52-48 per cent, 17 million to 16 million in a 72 per cent voter turnout, to leave. Even leaders of the winning pro-Brexit side in the referendum, such as Ukip’s Nigel Farage and Tory PM-in-waiting, Boris Johnson, admitted that they, too, had expected the Remain side to eke out a victory, and thus allow the U.K. to totter on as before. We hadn’t believed the warnings. We thought that the UK would muddle through, as it had done so often in the past. CNN’s Richard Quest touring England. In the often acrimonious debate leading up to the referendum, the one moment that stood out for me was a televised vignette about “ordinary” folks in the U.K. heartland. 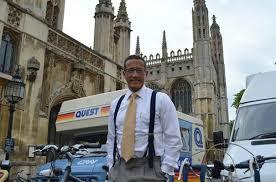 The gravel-voiced CNN financial correspondent Richard Quest had been kitted out in a sort of milkman’s delivery truck which he drove over hill and dale to gather the opinions of the non-politicians, non-experts, non-partisans, stopping in the marketplaces of obscure English towns to record “streeter” interviews. In the immediate aftermath of the unexpected referendum result, the amount of reportage, commentary, and theorising (to which I’m adding one more straw, but hoping not to break the camel’s back or exhaust the reader’s patience) was so voluminous as to be more than any one aggregator can digest. 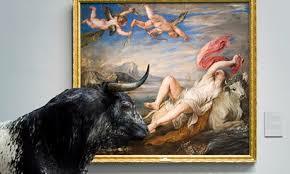 Granted that no single analysis can pretend to produce that aha! now-it’s-perfectly-clear illumination of the meaning of the vote, nonetheless there are a couple of things that are less murky than the big picture. One of them is the voter profile of those who cast their ballots for Remain and Leave. The winning Leave side was driven by older, white, less educated, small town dwelling, Englishmen and women, and they voted in large numbers. For example, over 80 per cent of eligible voters aged 65-plus turned out and a sizeable majority voted to Leave. The Remain-in-the-EU-side voter was characteristically younger, better educated, cosmopolitan in attitudes, and the inhabitant of big cities. However, a correspondingly lower proportion of the 18-24 demographic showed up to vote. Oh yes, there was one other variable that differentiated the two sides: the possession of a passport; Remain voters were more likely to have a passport and use it, while Leave voters tended not to have a passport and to be, both literally and figuratively, more insular. As well, citizens in Scotland and Northern Ireland, and the pro-globalization business class voted to Remain. So did a goodly chunk of other groups described as “elites,” who work in the media, the arts, and academia. The two variables most predictive of voting behaviour were age and education, and unsurprisingly, those variables tend to overlap. It’s only fair to note that the question of whether the demographics-and-lack-of-education combination is detrimental to political judgment is one of the fiercer threads in the post-mortem debate. I’d be inclined to say, at least in the case of Trump and his supporters, that the “ignorant angry-old-man” thesis is more than slightly plausible. However, there’s a strand of analysis, most frequently found on the left, that argues that the Brexit decision represents a sound rejection by the “people” of “globalization,” international capitalism, and especially smug “elites” (in business, the media, politics, and academia) who have been subjugating the popular masses for decades now. Advocates of the anti-elitist thesis are easy to locate. One of the most prominent of them is journalist Glenn Greenwald, author most recently of “Brexit Is Only the Latest Proof of the Insularity and Failure of Western Establishment Institutions,” (The Intercept, June 25, 2016). This isn’t the place to argue Greenwald’s piece, but after I’d counted the first 25 pejorative uses of the term “elite” in a single article by him, I must admit that I was tempted to put in a kind word for elites. Like, maybe they often know something that the much-romanticized “ordinary folks” don’t know? Or, perhaps a Platonic reminder that if you need to fix a waterpipe or a leaky heart valve, it’s a good idea to call in, respectively, an “elite” plumber or doctor. I do notice that in Greenwald’s excoriation of elites and his corollary reading of the Leave vote as a popular repudiation of globalization, that any suggestion of racism or ignorance as motivators is distinctly subdued. In addition to voter profiles, one other bit of clarity is that a key issue for Leave voters (confirmed in survey after survey) was “immigration.” It was more important than questions of economics, distaste for Brussels bureaucracy, and repudiation of globalization and/or elites. The unsettled question is, What did the rejection of immigration mean? Was it, as the Globe editorial (cited above) put it, “veiled racism” and an expression of xenophobia? Or is there a case to be made that immigration, especially from the EU, has been detrimental to Britain? If that issue hasn’t been settled by months of heated pre-referendum debate, you can be assured that it won’t be settled here either. Nor will it necessarily be settled by Brexit. The largest source of British immigration is the Asian sub-continent: people from India, Pakistan and Bangladesh, a legacy of both British colonialism and the existence of the British-led Commonwealth. Even so, out of the UK’s estimated 65 million population, only about 2.5 million, less than 3 per cent, are from the Indian sub-continent, and their presence won’t be affected by Brexit. The UK’s membership in the EU, which mandates a free flow of citizens among its members, has brought some 3 million other Europeans to live and work in Britain (Poland, Ireland and Germany are the three leading sources of such migration), while a corresponding million-plus Brits have settled or retired in parts of Europe outside the U.K. The latter categories, obviously, will be, in some way, affected by Brexit, even if not immediately. Beyond the facts, there’s a great deal of anecdotal evidence and action. 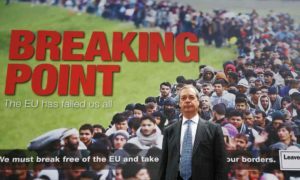 It ranges from blunt ugly remarks delivered by “perfectly sweet” late middle-aged citizens; to a referendum poster titled “Breaking Point,” featuring Ukip head Nigel Farage and in the background, a hoard of brown-skinned Syrian refugees presumably heading for England, Your England; to, worst of all, the murder, a few days before the referendum, of 41-year-old Labour MP Jo Cox, a Remain campaigner and mother of two young children, by an extreme right-wing, “Britain First,” and likely deranged, assassin. In the days immediately following the vote, there was also a noticeable uptick in racist incidents throughout England. As I say, there probably isn’t a definitive answer to the question of what “immigration” means, but I think the case for xenophobia and dislike of “others” has more substance than any of the competing explanations. There are real reasons for the present ungentle fury, says Harris: “a terrible shortage of homes, an impossibly precarious job market, a too-often overlooked sense that men (and men are particularly relevant here) who would once have been certain in their identity as miners, or steelworkers, now feel demeaned and ignored. The attempts of mainstream politics to still the anger have probably only made it worse.” Harris cites “oily tributes” to “hardworking families,” and the trope of “social mobility,” “with its suggestion that the only thing Westminster can offer working-class people is a specious chance of not being working class anymore.” Still, the equally specious promises of “minorstream” politics aren’t much of a solution. I think Harris is also good on the political blunders that led to the referendum. One other clear thing about the Brexit debate is that British Prime Minister David Cameron, the Conservative leader, called the referendum for primarily political reasons. He wanted to fend off the attractions of the right-wing Ukip party, and especially the possible revolt within his own party. “The Prime Minister evidently thought the whole debate could be cleanly started and finished in a matter of months,” Harris writes. Cameron’s chief Conservative political rival Boris Johnson “opportunistically embraced the cause of Brexit in much the same spirit. What they had not figured out was that a diffuse, scattershot popular anger had not yet decisively found a powerful enough outlet, but that the staging of a referendum and the cohering of the leave cause would deliver exactly that… And so it came to pass: the cause of leaving the EU, for so long the preserve of cranks and chancers, attracted a share of the popular vote for which any modern political party would give its eye teeth.” Among the casualties of the vote was Cameron himself. 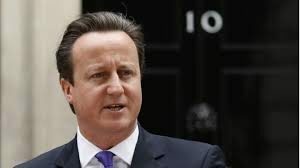 Although he proposed the referendum as a sort of election gimmick in the 2015 contest (a gimmick that worked), he also put himself at the head of the Remain camp, and once he lost the referendum vote, he promptly did “the honourable thing” and announced his resignation. 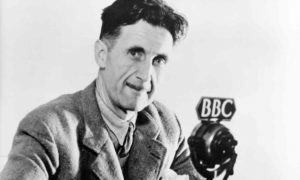 Although Orwell repeats the common trope, “England will be still be England… stretching into the past and future,” the same cannot be said for the United Kingdom. With both Scotland and Northern Ireland voting to remain in the EU, the possibility of a break-up of the UK may be part of the collateral damage of the referendum. Maybe Yardley’s most important point in the litany of problems is the reminder that “it is easy to forget that the European Union is an audacious political experiement to wash away the antagonisms of World War II and build a new Europe. Unity required putting aside the ancient rivalry between France and Germany, and binding together countries with different languages, cultures and economies.” The EU is one of the great utopian ideas of the second half of the 20th century. Critics could say that the embrace of the European idea was mainly limited to a privileged segment of a social class rather than to all of youth. If you were young, poor, and more or less trapped in a jobless outback, you weren’t waxing enthusiastic about “Europe.” That’s true, but it’s also the case that the cosmopolitan young who embraced the vision of a multicultural Europe are not dissimilar to the young people who gathered in civic squares throughout the Middle East during the “Arab Spring,” or the youthful protesters of the “Euromaidan” movement in Kiev, Ukraine in 2014. Unsurprisingly, at this sour moment, the idealism of the young is underrated. By the Monday morning after the Brexit vote, UK inhabitants were adjusting to the shock – bitterly, soberly, or gleefully, as the case may be. Prime Minister Cameron had honourably declared his intention to resign; the leader of the Labour Party opposition Jeremy Corbyn was in hot water with his party for having been too tepid during the referendum campaign; stock markets in London (and around the world) had predictably and precipitously sunk, and it was announced that they would be “volatile” for the next while; the value of the British pound had declined to a 30-year low as Britain’s credit rating was being cut by the rating agencies; and what in America are known as “Monday morning quarterbacks” were in the middle of the media’s All-Brexit-All-the-Time “breaking news / rolling coverage.” A day later, there was a second Brexit. All the while the referendum vote was on, so were the European soccer championships, a matter of probably as much or more importance to the victims of globalization as globalization itself. Improbably enough, England was bounced out of the tourament by losing 2-1 to, of all countries, Iceland. If nothing else, a bit of poetic justice. Freedland doesn’t report the christening events at this piece of Trump property, but I happened to catch The Donald on CNN. 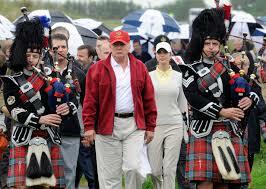 Surrounded by an entourage that consisted of bagpipers, muses in diaphanous gowns and sporting gear (wives and daughters and secretaries, I think) and meaty security guys, Trump proceeded to give a 13-minute speech about improvements to the sprinkler system, the putting greens and other amenities, to the consternation of reporters who expected that Trump would have something to say about the momentous political event that had occurred the night before. He did. “It’s a great thing,” he said, and then returned to the fine points of sprinkler systems and other matters of interest to landlords. Eventually, prodded by press and staff, Trump applauded the “great victory” that had been achieved by the Brexit crowd. As Freedland reports, “They had, he said, exercised their ‘sacred right’ to independence, taking back control of their economy and their borders.” Within a day or two, he was predicting the demise of the European Union. “Naturally,” continues Freedland, “he brought the subject back to himself and his own candidacy for the US presidency. ‘I think really people see a big parallel,’ he said. 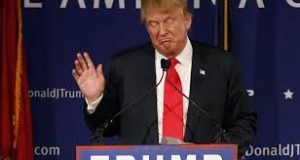 ‘A lot of people are talking about that.’” Added Freedland, “He was right, even if he’d made a mistake by delivering his congratulations in Scotland – whose voters had emphatically opted, by 62 per cent to 38 per cent, to remain inside the European Union.” Thus, Trump joined figures like France’s Marine Le Pen, various right-wing party heads in places like the Netherlands and Denmark, as well as governments in Russia and Iran, in praising the Brexit outcome. Whether he knew it or not, he was in the right company. 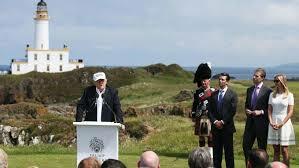 Trump’s bit of fortuitous travel, despite the tone-deafness of congratulating pro-EU Scots on departing the EU, is a reminder that looming over all these recent events – whether relatively small ones like the Austrian presidential election, or the German provincial contests, or fairly major ones, like Britain’s Brexit referendum – is a very large, very loud spectre named Donald Trump. It’s no doubt bad manners to mention Trump in relation to the leader of the Nazi Third Reich, but I notice that my Facebook feed has lately frequently carried the phrase, “Mein Trumpf,” a play on the title of Adolf Hitler’s book, Mein Kampf (My Struggle), and columnists have not been hesitant to haul out this skeleton from history’s closet. As Jochen Bittner said (in his New York Times column cited above), “The elites were blamed for the… chaos, and the masses were ripe for a strongman to return order to society. Some people today imagine that Hitler sneaked up on Germany, that too few people understood the threat. In fact, many mainstream politicians recognized the danger but they failed to stop him. Some didn’t want to: the conservatives parties and the nobility believed the little hothead could serve as their useful idiot, that as chancellor he would be contained by a squad of reasonable ministers.” One of the movers and shakers who imagined himself pulling the strings said, “We’ve hired him.” He was surprised when Hitler told him, “You’re fired!” Or is “You’re fired!” merely the tag line of a Reality TV show host named Donald Trump? Bittner adds, “At the same time, even the imminent threat of a fascist dictatorship couldn’t persuade the left-wing parties to join forces.” The German Communist Party branded their ideological closest allies, the center-left Social Democrats as the “moderate wing of fascism.” It was something like the more fervent supporters of Senator Bernie Sanders, the “Bernie or Bust” gang, declaring during the Democratic Party presidential primaries that the frontrunner and presumptive nominee Hillary Clinton was surely “a war criminal” (and much else). Baker begins with a recent comparison by former Massachusetts Republican governor William Weld of Trump’s anti-immigration program to Kristallnacht, “the night of horror in 1938 when rampaging Nazis smashed Jewish homes and businesses in Germany and killed scores of Jews.” The analogy may be provocative, Baker observes, but it’s not uncommon. Baker acknowledges that to Trump’s “supporters, such comparisons are deeply unfair smear tactics used to tar conservatives and scare voters.” But then again, the name-calling, bullying Trump, is not exactly a paragon of fairplay or good judgment. He seems to have no sense whatsoever of the classic admonition to bullies, Pick on someone your own size. Baker also cites the historian Robert Kagan, a scholar at the Brookings Institution, who says, “This could be one of those moments that’s quite dangerous and we’ll look back and wonder why we treated it as ho-hum at a time when we could have stopped it.” Kagan published an op-ed piece in the Washington Post, “This Is How Fascism Comes to America” (May 18, 2016), that attracted wide attention, in part because Kagan is thought of as a neoconservative himself. “We’re supposed to believe,” writes Kagan, “that Trump’s support stems from economic stagnation or dislocation. Maybe some of it does. But what Trump offers his followers are not economic remedies – his proposals change daily. What he offers is an attitude, an aura of crude strength and machismo, a boasting disrespect for the niceties of democratic culture that he claims, and his followers believe, has produced national weakness and incompetence. His incoherent and contradictory utterances have one thing in common: they provoke and play on feelings of resentment and disdain, intermingled with bits of fear, hatred and anger. His public discourse consists of attacking or ridiculing a wide range of ‘others’ – Muslims, Hispanics, women, Chinese, Mexicans, Europeans, Arabs, immigrants, refugees – whom he depicts either as threats or as objects of derision. His program, such as it is, consists chiefly of promises to get tough with foreigners and people of nonwhite complexion. He will deport them, bar them, get them to knuckle under, make them pay up or make them shut up.” It’s a fairly complete indictment, and not inaccurate. As I noted at the outset of this gloomy meditation, we nonetheless have to be careful not to issue alarmist generalizations as though the continued rise of the right is a kind of destiny or determinist future. It’s true that nobody, at this time, knows exactly what to do. Personally, I prefer the old solution, namely, more education, to the current solution, which is apparently, more Tweets. In any case, not all is lost. In Austria we dodged a metaphorical bullet, not one from the gun-carrying right wing candidate’s weapon of choice. Many of the right-wing parties and movements, such as the Germany’s Alternative for Deutschland, may remain minority irritants rather than actual imminent threats. Though Brexit may focus our attention on the considerable flaws and failings of the EU, it’s also the case that there’s considerable support and energy for the “European idea.” Brexit may have passed, but half of British voters cast a ballot for remaining in the EU. 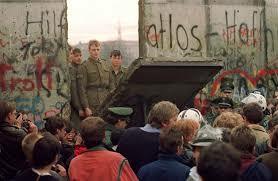 Still, Europe has had plenty of the afterlife of totalitarianism. It could do without any more. That said, we’re deeply split, in much of Europe, and certainly in Britain and the U.S. As for Trump, although anything can happen when we’re contemplating electoral events that are several months off, there’s reason to think that Hillary Clinton has a solid chance to become president, and that Donald Trump simply represented a temporary high water mark in American populism during an especially confusing political era, and that he will quickly sink to the appropriate level – perhaps that level is gutter runoff after a flash flood.